I'm a bad mom. You are a bad mom. We are all bad moms. I don't know a mom out there that doesn't want what is best for their family. I know we are all working hard. We are all striving, hour after hour, to raise our kids. But we can never live up to our own expectations. We can never live up to society's expectations. We are bad moms. I'm a bad mom because I stayed up late tonight to write a post about being a bad mom when I should be in bed getting the recommend eight hours of sleep before my 12 month old wakes up to nurse at 11:30 at night. And at 3:30. And at 5 am. But I'm also a fulfilled mom, because I took an hour before bed to do something I love and unwind on the internet. But tomorrow I'll be a little sleepy. Maybe I'll have coffee. I think about it this way: If I already accept the fact that I am a bad mom, how can I go all sanctimommy on a facebook friend or random target shopper? I'm too busy trying to fix my own issues to point fingers at another mom. And if I do need to mention something, coming from a place where I recognize my own failures helps me speak with love and not judgement. So, when a mom who has her head stuck so far up her skinny vanilla latte tells you to spot your kid at the playground or asks you why Junior isn't wearing a hat, you can look at her as another bad mom and not like the angel God has just sent to help you change your ways. She's a bad mom, she just doesn't recognize it yet. Pity her. And of course she would point out a different parenting style and of course she wouldn't know Junior owns four hats and likes throw them at other kids, so you left them at home. She's not recognizing the fact that she's a bad mother and your a bad mother. Instead of judgment, we should all celebrate our fallibleness and inability to cope on six hours of sleep and skinny vanilla lattes. What I am saying is: you are a mom. You are trying your best. You love your kids. You are going to make mistakes. 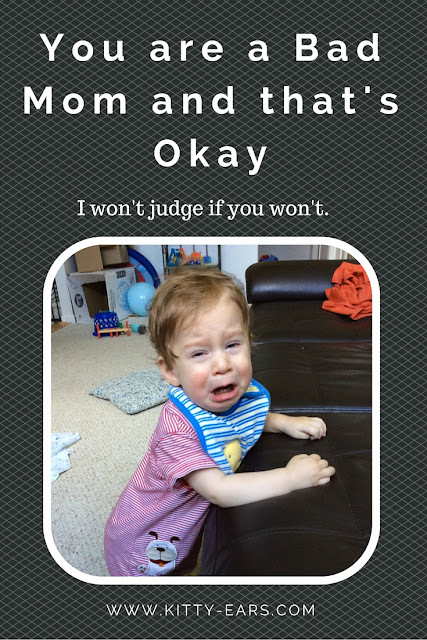 It's stressful enough without other moms pilling on their own guilt and expectations. It's stressful enough when you feel alone in this great big world with three under three and a pile of unwashed laundry and dirty hair. You will fail sometimes. Maybe more times than you would like. Definitely more times than the public thinks you should. Embrace your choice to baby-wear even through "your toddler can walk". That Other Human who opened their mouth to tell you how they think you should tow your teething 18 month old does not have to chase said 18-month old through target or keep said 18-month old from trying to eat the colorful contraptions in the dollar bin. Smile. Or don't. But embrace your choice, because most people won't and you don't have time to doubt yourself. Embrace bottle feeding. Formula. Breastfeeding. Hats. Gloves. Mismatched socks. Crying. Stares. Cloth diapers. Disposable diapers. Baby led weening. Purees. I mean, I am not telling you not to research. Research the heck out of everything. Talk to your doctor. Your friends. The older woman at the coffee shop in line in front of you who is holding one kid in each hand and looks exasperated. The lady behind your pew in church. The UPS delivery guy. Okay, maybe not the delivery guy. But you get the idea. Research. And make the decision you think is best for your kid. And than when someone questions that decision in the checkout line of target, look them square in the eye and state, with perhaps a smirk, that Junior with the buggery nose is your little angel and goodness if you aren't his mommy and therefore completely qualified to make any and all decisions regarding his person. You are a mom. Your opinion matters more than anyone elses in your child's life. You might be a bad mom. (Honestly I think we all are to some extent because we are all HUMAN and all humans struggle with something) You might be a worried mom. Or a tired mom. Or a frazzled mom. Or a running-on-coffee-day-two mom. But you know what word matters most? Mom. You are a mom. Add any other word you want--and it still doesn't take away from the simple fact that you are, indeed, a mother.